A German-speaking Italian born in December 1944 in Villnöss-Fùnes in Southern Tyrol, Reinhold Messner is the second of a family of nine children. After his studies, he taught mathematics, natural science and PE in an Italian school. Rapidly though, following his successes in the Himalayas, he quits teaching to devote himself entirely to great Himalayan and Polar adventures. In 1999, as top candidate for the Italian greens of the Tyrol, he is elected Member of the European Parliament. Today, Messner lives between his flat in Munich and his mediaeval Castle of Juval where he keeps his private life truly hidden. He is the father of three children, two girls and a boy. He was the first, with Peter Habeler, to make a successful ascent to the roof of the world without oxygen in 1978, and the first to climb the Everest solo in 1980. He was also the first to succeed in climbing the 14 summits of more than 8,000 metres. He was also the first to have climbed the "Seven Summits", i.e. the highest points of the seven continents (North America, South America, Africa, Europe, Asia, the Antarctic and Oceania). In 1990, he crossed the Antarctic pulling sledges with Arved Fuchs (departure from Patriot Hills, arrival via the pole at MacMurdo) in 92 days (1,500 miles). In 2004, he crossed the Gobi Desert by foot (1,250 miles). 1970: first ascent of Nanga Parbat (8,126m) via the Rupal Glacier, with his brother, Günther Messner. The latter disappeared during their descent, on the Diamir side. 1972: first ascent of Manaslu (8,163 m) by the southern face and third ascent of this summit. Two of his companions lost their lives in the so-called Valley Of Butterflies. 1974: opening of a new route on the southern face of Aconcagua (6,960m). Failure on Makalu (8,471 m). 1975: first alpine style ascent of Gasherbrum I (8,068 m), north face, with Peter Habeler. Failure on Lhotse (8,516m), south face. 1976: ascent of Mount McKinley (Alaska). 1977: attempt on Dhaulagiri (8n167 m), southeast face. 1978: first ascent without oxygen of Everest (8,848m) in the company of Peter Habeler. Before then, this feat was considered to be physiologically impossible for a human being because of the altitude. 1978: world first, he reaches the summit of Nanga Parbat (8,126m) solo and opens a new route through the Diamir Glacier. 1979: first ascent of K2 (8611 m) in rabbit style, roped together with Michel Dascher. 1980: first ascent of the North Wall of Everest in winter. 1981: first up Shishapangma (8,046 m), on the north face by a variation of the normal route. Second failure on Makalu (8,471 m), by the southeastern ridge. 1982: he climbs three 8,000-metre peaks: Kangchenjunga (8,586 m) by its northern face, lightly roped; Gasherbrum II (8,035m) and Broad Peak (8,047m). Failure on Lcho Oyu on the southeast face. First mountaineer to climb three 8,000-metre peaks in the same season. 1984: Gasherbrum I & II in sequence in the company of Hans Kammerlander. 1985: first ascent of the north-western face of Annapurna (8,031m). One month later, he was successful on Dhaulagiri (8,167m). 1986: he climbs two 8,000-metre peaks: 3rd attempt and success on Makalu (8,471m); ascent of Lhotse (8,516 m), with his friend Hans Kammerlander. 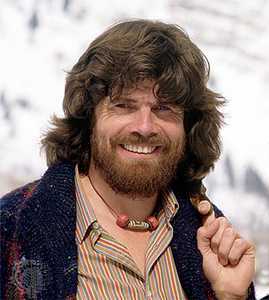 Messner thus completed, on 16 October 1986, the ascent of the planet's fourteen 8,000-metre peaks. He was the first man to achieve this feat. 1986: Ascent of Mount Vinson (4,897m) in the Antarctic. Messner became the first man to have climbed the highest points of the seven continents (North America, South America, Africa, Europe, Asia, the Antarctic and Oceania).